Today we feast, not fast, as we celebrate Mary’s yes. So, we do not fast – we feast on Friday. Why? Because the Solemnity takes precedence. It invites us into mystery. The mystery of Mary’s cooperation in God’s plan. Also, our cooperation in God’s plan. In the midst of all of the challenges we face as Catholic Christians in a Culture which has forgotten God, we celebrate God’s loving plan and the remember the heart of the Christian message, conversion through Jesus Christ. 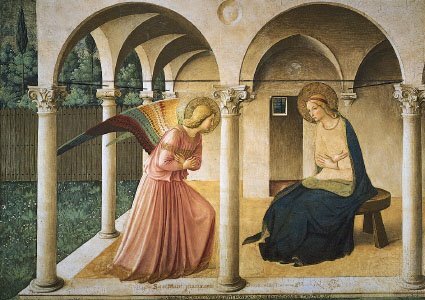 The great event of the Annunciation reveals the path to salvation and to cultural recovery. The little Virgin of Nazareth teaches us how to live our real lives in a real world! When the Angel of the Lord appeared, bearing the message and calling her to a special mission, she said “YES.” We must say “Yes” as well and believe that “nothing is impossible with God.” Let’s consider her response to the message: “I am the handmaiden of the Lord; let it be to me according to your Word.” It is in these words that we discover the heart of the Christian vocation. When Mary spoke those words, human history was forever changed. They came from a deep spiritual reservoir within the heart of a young Jewish girl who was in love with the God of her fathers – Abraham, Isaac and Jacob. Mary´s “Yes” is called the Fiat: in Latin, “Let it be done.” Mary´s Fiat was spoken from a heart filled with love for God. In a Biblical context, “heart” is a word that means much more than the fleshy organ at the center of our chest cavity. It refers to our center, the core of each of us, the place where our deepest identity is rooted, and from which our fundamental choices about life are made. Mary´s words proceeded from a humble heart. Continue reading here. This entry was posted in Liturgical Year, Saints and tagged Catholic, Mary and Saints, Solemnity. Bookmark the permalink.